Antiques challenge. David Harper and Anita Manning travel through Yorkshire, where David learns about a 500-year-old mystery, and Anita meets two inspirational land girls. So, will it be the high road to glory or a slow road to disaster? man of mystery David Harper and fellow treasure hunter Anita Manning. I am enjoying this early-morning drive in Yorkshire. but we are nice and cosy-tosy in a lovely wee Moggie. Sorry, can you say that in English for me again, so I understand? but antiques dealer David is a whiz at spotting hidden gems. He is perhaps not always as successful with the ladies, though. I don't know about men with big heads! Anita specialises in jewellery and dressing up. and their stage is God's own country, rural Yorkshire. -Fields, horses jumping over fences, all that sort of stuff. Stop leaping yourself, if you don't mind. Both made a loss at the first auction. Got any advice for your rival, Anita? Seeing as how you are out front. I would keep away from these bits of cars and old bits of iron. Anita and David are travelling over 700 miles. Yorkshire all the way to Bonnie Scotland and the town of Paisley. ending up at an auction in Harrogate. Bar Farm Antiques occupies several old farm buildings, funnily enough. Look! Is that one of your girlfriends? Listen, I'm off. I will see you later. Have a great day. David spots something straight off the bat. That is a really, really wild thing. What on earth was it? Well, I'm guessing we are talking about police station, circa 1955.
you are on that side, I have nabbed you. You are in big trouble and I want your fingerprints. I want to call it a machine. for the first time to convict a murderer. David likes it, so let's meet dealer Greg from New Orleans. -What's it like having your fingerprints taken, Greg? -Are you looking for a price? -I think that is a pretty good price for a piece of furniture. -No, it can't be 20. You can't do a little better than that? Compromise, meet in the middle? And where was the middle starting? -Good man. Thank you very much. Great deal and David's first item in the old bag. the beautiful walled city of York. Where the infamous Guy Fawkes was born and educated. and Becky is on hand to assist. Stand by, Becky. Here comes Anita. -I quite like these wee silly condiments up here. They are a heck of a good fun. I think they are probably Continental. Oh, I am quite tempted. -That one has got a school tie on. They have a collective price of £26. -How did we get on? -He can do two for 18. -Ah, wonderful, wonderful. Thank you very much. -They are fun, aren't they? One lot secured and it is time for some celebratory dressing up. David is also at it. Dear, oh, dear. Tell you something, this is quite unusual, isn't it? It is a neat thing. it is nice. And the way it is just worn. George VI, he was on the throne from 1937 to our current Queen. Greg got this sign from a local Post Office. Items like this can be hugely collectable. "Can" being the operative word. -I would have a go at 30 or 40. -Is that anywhere near for you? -It might be all right. 40 is all right. I will have a go at 40. -OK, I want you to make some money. -Thank you very much. Good show. Well, that was easy. At £40, that is another good deal. And HRH Anita has also made an interesting find. -it's all "kid on", isn't it? I don't mind it being "kid on". Otherwise known as costume jewellery, Anita. Ticket price £18. -If I can get it for a tenner, that would be great. -Do you want to try? Do your best for me, darling. Anita is all about the cheeky offers today. But will Becky come through for her again? You have been very good. Yes, a tenner is good indeed. Frugal Anita has now bought two items for just £28. David, meanwhile, is still exploring. I have a bit of a love-hate relationship with sofas like this. He has found a 1920s drop-end settee. Let me demonstrate how this sofa works. Greg, please step into my office. -How are the springs feeling? ..you don't want. No, they are sticking in places you don't want. Not surprising, in those tight trousers, David. -Ah, I can lay down. So it converts into a little chaise. -Don't fall asleep, I'm not that boring! over £1,000 to restore and cover. The wheels are worth five. -Greg, it's a delight doing business with you. David has spent a total of £70 on three items. Pretty good for a morning's shopping! a small village on the outskirts of York. an institution that was established during the First World War. to build food supplies. Bless 'em! Who were the Land Girls? all the things a man would have traditionally done. -I imagine it might have been a bit of a shock to the system. To get involved in very hard manual labour. Yeah, I imagine it would have been. so, yes, it was very hard work at the time. -Yeah, it could be very dangerous. women were encouraged to return to more ladylike occupations. That doesn't seem awful fair, does it? -They'd been given a taste of freedom. Off you go back home to the kitchen! to help the women's suffrage movement. women had been afforded the right to vote for over a decade. How many women worked on the land? How many Land Girls did we have? there was about 80,000 of them. Dorothy Taylor and Iris Newbold are two of these exceptional women. are two of only three that are still alive today. -What was your favourite job? I loved haymaking, the old way. and roll home with the horse and wagon. Wonderful days, I loved hay time. and you'd meet some of the lovely people on the way. and it was just friendly all the way. Dorothy came from a mining community and Iris was a city girl. when you look back on it. -It made me a different person. Three-and-a-half years made a difference to you altogether. the girls still found the energy for a bit of fun. -were you able to go out and play? so you had to walk into town after you'd finished work. then you had to walk back again. Girls, what did it feel like after the war, when the war was over? -And then you were sent back into the kitchen. and get over the shock of changing again to city life. And I went into Marks & Spencer! the jobs they carried out were vital in keeping Britain fed. in developing women's future economic and political rights. Now, what's David up to? where dealer Michael is on hand to help him spend his remaining £96. What about that ginger jar there? Can I have a quick look at that? is, obviously, that it's been drilled. It's been drilled, has it? -Gosh, it's a nice pot, isn't it? -It's without its lid, obviously. -when the ginger was eaten up. These symbols here are Buddhist, aren't they? But it's very good quality for a ginger jar. if there's any movement on the ticket price. £55 is the very best. Well, at £55, Michael, I've just got to say yes. Thank you very much indeed, That is brilliant. For £55, the Chinese ginger jar is David's last purchase of the day. for another exciting day's shopping tomorrow. Next morning, our duo are hitting the antique trail once more. the gateway to the North. The sun is shining, the sky is blue. You look so glamorous, though! a 1920s drop-end settee and a Chinese ginger jar lamp. Today, he has just £41.46 left to spend. Anita, in contrast, went small. She bought two pairs of condiment sets and a 1950s brooch. she still has £164.14 left for today. and to Anita's first shop today. So what treasures await you here, then, Anita? I've just been shown this wonderful board of photographs. Now, these photographs are showing the war weekend in Pickering. and they get all dressed up in uniforms and look who we have here! and there is Dorothy and there is Iris. and don't they look smart! Sadly, this is not for sale, but what else has she found? Owner Caroline is on duty to help. I notice you had some Mauchline ware there. -Could I have a wee look at it? -These have just come in, have these ones. I'm very fond of Mauchline ware. -which was associated with Robert Burns. pocket watch holder, needle box and money box. They have a collective ticket price of £62. I would like to be paying in the region of around about £20 for them. -I couldn't go that low, no. -Could you come to 25? -Would you do 25? That's lovely. Thank you very much, Caroline. Swift business! Oh, there is more! This is like Italian glass. It's like Murano glass. That's the word. I couldn't remember! but there's nothing to indicate on the base. for centuries and is very collectable. it is Italian, with a price of £48. Would you do 20 on that? Anita has now spent a total of £45 in this shop. that has held an amazing secret for most of its existence. Archaeologist Dr Kate Giles is showing him around. Kate, I really didn't expect to see pictures painted onto the wall. I've never seen anything quite like them in my life before. what did they mean to people in the 15th and 16th century? who are hugely revered by the medieval Christians. Well, even I can recognise George. St George and the Dragon, yes, that's absolutely right. were placed in calendar order. This makes them the only medieval paintings of their kind in the UK. and the first saint's day depicted in the church paintings is in April. So, this is the beginning of the calendar with George, April. That's right, and then we have May with Christopher. and then November and December by the time we get to the east end. moving around monastic houses and churches of the region. Of course, they've faded over the last several hundred years. Would they have been really bright and vibrant in their day? and that's part of what these paintings are designed to do. But these exquisite images spent many years under whitewash. that anybody would dream of covering them up? -images of saints were highly controversial. was sparked by corruption within the Catholic Church. such as the veneration of the saints, which became outlawed. during the course of restoration works in 1852.
by the incumbent vicar, Ponsonby. expressing his concern about the paintings. surrounding the Catholic nature of the images. He was also concerned that they would distract from his sermons. "until they have been copied by some skilful or competent artists." then covered them up once more. It was another 20 years until they were rediscovered again. and he decides to uncover them yet again. giving them a distinctive 19th-century Pre-Raphaelite feel. As it's the 19th-century, Victorians would call it being improved. which we found in the vestry of the church. had been lost and found several times. if there's anything else yet to be discovered. or come out of the drawers or archives in the future. attracting thousands of visitors each year. and on which he based the fictional town of Darrowby. with just under £120 left to spend. Ah, something shiny has caught her eye. -Could I take this outside to have a wee look at it? You not going to do a runner, are you? Judging by the glint in Anita's eye, she is up to something, though. I wanted to see this in the light. which would have been used to hold the host during Mass. but what I thought when I handled it was, "Is this silver? "Is this silver and not silver plate?" and that's indicating that it is a softer metal. Now, silver plate would be a harder metal than that. and it also has markings, which are Continental and complicated. both pieces would not have been hallmarked like that. So that's giving me another indication that it may be silver. This might be the Holy Grail! Now, that really would be something, wouldn't it? that she believes to be made of solid silver. has driven east to the picturesque village of Thornton Le Dale. and he's meeting manager and dealer Jan. Hi, Jan! -This is a different, quirky item. -Is it a watering can? It's from a railway and they used it for flares in emergencies. -No! So, what's it fired by? -It would be dropped on the line. -It would be like a Roman torch. In a line so that, in emergencies, they could see what was going on. Emergencies could be anything from heavy fog to signal failure. -Even earlier, actually, I think. and it's not the only piece of railway interest. -Just one more piece of railwayana as well. -What's all this with you and railwayana? You do not look like someone who is a train spotter! -train spotter! Are you not? -OK, so this is a gear lever of some disruption. It comes from sort of the tender, engine box. -Actually, is it very heavy? -It is very heavy, yes. -It's made of cast iron. -Let's have a look at it. Oh, gosh, yes! And when you say a tender box, it actually would be on the train? -I love that, I absolutely love that. Its price is £35, but can Jan do a deal on the lever and the flare lamp? -Do you want all my money? -I want all your money. of two pieces of railway interest. and the 1920s drop end settee. and a white metal cyborium with gilt interior. So, what do they think of each other's items? they are diabolical beyond belief! and need to be chucked in the nearest bin possible. is he has bought definitely the weird! it's just another big lump of old iron. by a popular property website in 2013 and 2014.
happy Harrogate seems to have rubbed off on our excited pair. would we have this beautiful greenery all around about us? I always say that, actually. Second auction, David, let the battle commence! Oh, my kind of woman. Come on! and the auctioneer is George Allen. but cheap items, I'm afraid. They're not going to do a right lot of money at all. you'll be quite surprised by how much that is going to make. Let's hope so! Time for the auction. On our thrones, Anita, thrones. Can we see five anywhere on that one? £2? The flags are up now. -Four bid, six bid, eight bid. Ten, is that, number nine? It is ten bid. 12 bid. 14, lovely attractive lady on the front. 14 bid. 14 bid, is that 16, number nine? 14 the bid. 14 bid. You're out, sir. 16 bid, any advance on 16? Any more? 20. 22. 22 bid, any more? All done? Don't miss out on these. 22 bid. -Are you all done at £22? Not a king's ransom, but still a profit. That was pressure, wasn't it? From two! I thought they were going to sell for two. So did I, my wee heart was beating! -Next up are David's train lever and flare lamp. -Shall I hold your wee hand? I think you're going to have to. This is for the two items. Five bid, five the bid. Any advance on five? Ten bid, here we go. 15 bid. 20, 25, 30, 35 bid, 40 bid. £40 the bid, 45, 50 bid. £50 bid. Any more? 55 bid, 60 bid. 65 bid. 75. 80 bid. 85 bid. Any more? -When is it going to stop? 95, round it up, make it to double figures. 100 bid. -That's more like it, yeah. David has more than doubled his money. -I was digging my nails into your hand. Now, it's Anita's 1950s brooch. Four bid, £4 bid. £6, £8 bid. Eight the bid and ten. Ten bid, 12 bid, 14. -14 bid. Any advance on 14? Come on, buy it for your lady. 14 bid, any more? Another one? 14, 15, he's back in. 15, 16. 16 bid, any more? All done at £16? -You're going to miss out on this one. She got it at a great price. Still, it's a small profit for Anita. Now it's David's most expensive item - his Chinese ginger jar. -Has your heart started going? I am 50 bid, straight in at 50. 60 on the telephone. £60 bid. 70 on the book, £70 bid. 80 bid. 90 with me. 95 bid. -100 bid on the book. Any advance on 100? I'm into triple figures. Any more? -Ohhhhh, that's a good one! -Listen, let me give you a wee kiss. Wow! That's another great profit for David. He went big with his buys and, so far, it seems to be paying off. -to stay in the game. £10 bid, any advance on 10? Any more? All done? 15? -One piece is worth more than that. 20 bid. £20 the bid. £20 bid. 25 bid. The lady in blue is back in at 25. £30 the bid, I'll take 2.50 if it will help anybody. £30 the bid, any more? All done? 32.50 bid, are you all done at 32.50? Another profit for Anita - what a brilliant crowd here today! I love his 50ps! It makes all the difference. -He gets every single penny! -He doesn't half, he doesn't half. Let's see if Anita's next item can bring in a few more. -It may not be Murano, but it still is an Italian vase. Ten bid. Any advance? 15. 20. -It's all over, it's all over! 40 bid. 45. 50 bid. -Any advance? 55 bid. 60. -Any advance? 65 bid. 65. £70 the bid. 75 bid. 80 bid. 85 bid. 85 the bid, any advance on 85? An exciting lot, there. 90 bid. -£90. 95 bid. £100 bid. We've hit the magic mark. 100 bid. -105 the bid. Any more? 110. 110, the lady is back in at 110. That's an incredible profit for Anita. She has quadrupled her money, putting her firmly back in the game. Now, let's see if David's 1940s letterbox gets the same reception. 40. 50. £50 bid. Any advance on 50? 60. 70. £70 bid. 80. 90. 100 with me. £100 bid. Come on! Cling onto me. 130 bid. Any advance on 130? I'm out. In the room at the very back there at £130 the bid. Well done, David! Another massive profit. Quite the auction today! -This is wonderful! Isn't it wonderful? -It is, it is wonderful. David got his 1920s sofa for a steal, but will it fare today? Ten bid. £10 bid, 20 bid. 30 bid. 40 bid. £40, 50 bid. 60 bid. £60 the bid, 70 bid. 70 bid, lovely piece. 80 bid. £80 the bid. -90. Magic figure, £90 the bid, any more? -Come on, get another hundred. 110. 110, it's selling itself. 110 the bid. Any more? All done at £110? 200? It's more than that. It's about 4 million. We're both rubbish at maths! Apparently so. It's actually just over 2,000% profit. Next, It's Anita's incredible find - her cyborium. -so it's being sold as white metal. 20 bid. It's not where we start, it's where we finish. 30 bid. £30 the bid. 35. 40 bid. 50 bid, any advance on 50? 55. 55, you won't get another one. -55, 60 bid. 65 bid. Any advance on 65? It's worth a lot more. 65. 70 bid. 75 bid. Any more? All done? Finished at £75? A stroke of luck or divine intervention? Either way, that's a fantastic profit. Profits all over the place! What a feeling, eh? It's certainly too close to call. Can we see 20? Ten bid. £10 bid, any advance on ten? You'll never get another one. -You'd never WANT another one! -£20 the bid. Any advance on 20? The bid is at the back of the room. £30, any more? All done? Finished at £30 only bid? -Well done, that's all right. It's small, but it's still a profit. What an incredible auction with no losses! Now, that makes a change, doesn't it? David, that was absolutely fabulous! -let's go straight for the champagne! -You are my kind of girl! let's find out who came out on top. Anita started this leg with £192.14. leaving her with £318.65 to spend next time. David, however, emerges victorious this week. He started off with £166.46. so takes forward £385.86 to the following leg. What an amazing day it's been! So, cheerio, chaps! Next time on Antiques Road Trip, Anita considers other career options. Whilst David takes a leaf out of his competitor's book. I am desperate to buy it if it's cheap. 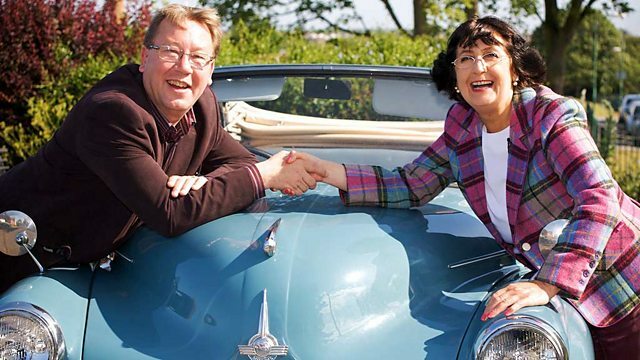 David Harper and Anita Manning travel through Yorkshire. Along the way, David learns about a 500-year-old mystery, and Anita meets two inspirational land girls before she and David head towards their second auction in Harrogate.